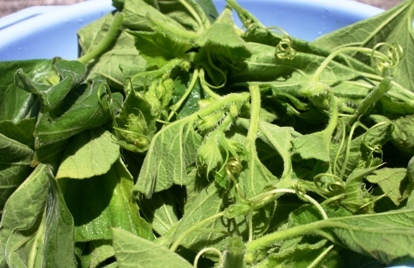 At the weekly farmer’s market in Modica, Sicily, I found freshly cut tenerumi, vine tendrils and leaves of the cucuzza plant. Though I had eaten them a few times, and enjoyed their pleasantly nutty taste with a slightly bitter edge, I’d never cooked them myself. But I was feeling extravagant, so plunked down my 1 euro and 50 cents, gambling on making something good out of a couple of bunches. The vendor suggested that I boil them and then dress them with olive oil, a classically simple cooking method used for many Sicilian greens- I suspect if you use excellent olive oil, it would make even cooked grass taste good. But I wanted more info, so I phoned Emanuele’s sister Elisa for further advice. It just so happened that her sister Nella was visiting, and as I was jotting down the cooking instructions, Nella disagreed, and took over the phone, so I ended up combining their advice into a final recipe. 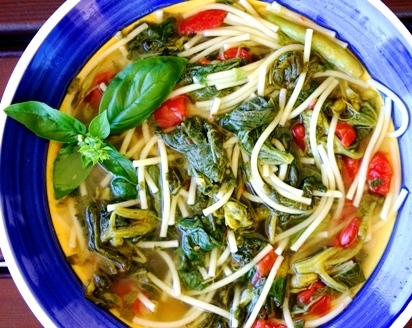 The recipe below makes tenerumi cooked greens, or you can then continue, as I did, and make tenerumi soup with pasta and greens. 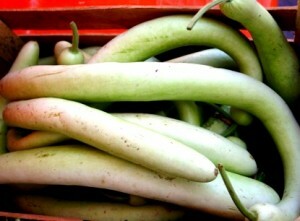 If you find a few tiny underdeveloped cucuzze, break them in half and add those to the basin. Change the water a couple of times to make sure there is no grit left in the leaves. Pile the washed tenerumi in a colander. Place the tomatoes in the boiling water for a minute, then take them out and place them in cold water so that they will now be easy to peel. Add some salt to the boiling water, put in the tenerumi, cover and simmer until almost tender but still bright green in color. Meanwhile, in another pot, sauté the garlic clove in the olive oil, then discard the clove. Peel the tomatoes, cut into small pieces, and add to the oil. Add the optional hot pepper if you want a piccante touch. Take the cooked greens out of the pot but save the cooking water – I do this by taking out clumps of greens with tongs, and plopping them on a big cutting board. Roughly chop the tenerumi and add them to the sautè pot. Cook until tomatoes are soft, adding a few tablespoons of cooking water. Stir in a few basil leaves, and salt to taste. Serve as a side dish tenerumi greens – sop up the oil and juice with thick crusty bread and you have a good summer lunch. This is the same dish my mom made at the end of summer every year.As we are Sicilian it was the norm, and it tastes of the last kiss of summer. Simon- Tell me more about these cucchiteddi! I am 2nd generation Sicilian and my wife is irish/german but cooks italian for our 42 years of marriage. Mom and dad would make cucuzza stew and tinerumi soup..delicious. I now grow cucuzza in my backyard garden and they do wonderfully. There’s plenty to share with sons daughter and their families.I built a large supporting structure and it is covered with vines. Happy to correspond. This is a wonderful thread here I was thinking I was the only one eating these tender missals. I have been growing cucuzza since I was a kid with my grandfather. 2 years ago I was fortunate to get some seeds from my dad that came from sicily. I grew them last year and i managed to grow one that was almost 7 long. That was saved for seeds. I pick them much smaller then that. I make a tenerumi and cucuzza pasta the way my Nonna and mom used to make. I’ve grown up eating this. No luck growing it though. My parents seem to be the only ones able to grow it here in US. Can this be purchased anywhere in the states? 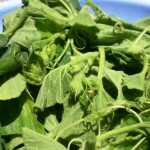 Grow it every year usually have with pasta or alone sauted in evoo and garlic. Last summer brought a sack to friends who own an Italian restaurant. She made a WONDERFUL soup. I said this looks familiar.v Found old Sicilian cookbook grom 1962. Recipe was identical. The best. It’s always great to hear from another cucuzza fan!